Fast Acting-Mud Mask, Enzyme Peel. The Mud Rapidly Pushes The Enzyme Peel Deep So More Accumulated Layers Of Dead Skin Are Removed, Immediately Age Spots, Hyper Pigmentation And Blemishes Are Less Visible. Pores Are Cleansed And Reduced And Your Skin Tightens And Lifts. This Product Is Truly Amazing. No Chemicals-Only Natural Food Source Ingredients Are Used In The Making Of This Product. 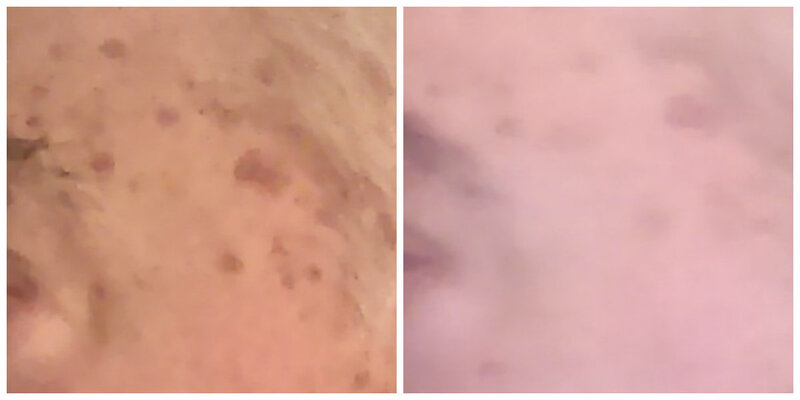 These Before And After Photos Demonstrate The Power Of This Product. This Test Subject Used Mudzyme To Reduce The Appearance Of Age Spots On His Left Temple Area. And Only Used It 10 Times Over A Period Of 3 Weeks. The After Picture Has A Different Color Tint Because The Subject Took The Picture Right After Rinsing Off And Redness Is Normal After Using The Product. The Peel Used In This Product Is Made With Fresh Fruits And Vegetables That Are Hand-Washed, Chopped And Placed In A Fermentation Tank With Our Own Unique Live Cultures. When The Enzymes Become Their Most Active We Stop The Process And Make The Peel. No Chemicals Are Added To The Peel, It Doesn't Need Any, Its Very Powerful With Only The Live Enzymes. What's The Difference Between Chemicals And Enzymes Used In Peels? Chemicals Burn The Skin And Enzymes Loosen The Protein Holding The Skin Cells Together So They Easily Wash Off. Regularly Using Chemicals Like Glycolic Acid, Lactic Acid Or Salicyclic Acid Which Are Basically Burning Your Skin Is Not The Healthiest Choice Over The Long Term. Read The Ingredients On Other Enzyme Peels And Most Likely You Will See Chemicals Added Because They Won't Work Without Them. The Reason-They Are Using Dehydrated Fruits And When The Enzymes Are Exposed To That Heat They Become Inactive. The Clay We Use To Make The Mud Is A One Of A Kind Rare Earth Mineral Clay That You Will Only See In Our Products. Every Mineral In This Clay Is Bio-Available Which Means They Are Wrapped In Amino Acids And Can Readily Be Used By Your Cells. Plus This Clay Has A Nano Tube Structure That Allows A Deeper Level Of Detoxification And Nutrient Delivery. To Make Mudzyme We Combine The Enzyme Peel And The Mud Mask In A Specific Ratio. We Guarantee The Results You Get From This Facial Mask Are The Best Available And Isn't Messy Like Other Masks And Takes Very Little Time. The Enzymes Are Very Active And Can Create Gas Similar To Champagne, Beer Or Soda. Gently loosen The Top And Allow The Gas To Dissipate Before Pouring Into Your Hand. For Spot Treatment Allow To Completely Dry, Then Rinse. Everyday Use Is Fine for 5 Consecutive Days Then Allow Your Skin To Rest A Few Day Before More Applications. You Can Use This Spot Treatment To Reduce The Appearance Of Spots Anywhere, Face, Arms, Torso, Legs. For Large Stubborn Spots Apply So You Cover At Least An Inch Around The Spot And Dab Enough on The Spot So The Mudzyme Makes The Spot Invisible, Then Just Let It Dry And Do Its Magic. When Using As A Facial Treatment, We Recommend Not Leaving On Longer Than 5 Minutes And No More Than Every Other Day Use. Redness Is Normal When Using This Product. Do Not Over Use This Product By Leaving On To Long Or Using More Than We Recommend. Dispense A Small Amount In Your Hand And Spread Evenly On Your Face. Wait A Couple Of Minutes For The Enzymes To Absorb So You Feel A Tingle And Can See Increased Blood Flow And Allow That Effect To Continue A few More Minutes Then Rinse Off.